For example, if a law student works for a law firm and accompanies the firm’s lawyers to court to observe proceedings, to depositions to observe how to examine witnesses, or sits in on client meetings to learn interview techniques, then the intern is receiving the primary benefit, since this arrangement truly resembles a learning experience. But, if the law student is assigned responsibilities such as filing, opening mail, and answering the phone, then the internship more closely resembles a paralegal or assistant position, which primarily benefits the law firm, since it provides little, if any, opportunity for the student to learn. In this latter example, the law firm would be liable for wages to the intern. In Velarde, the plaintiff was a student at a for-profit cosmetology training school. The school provided, as a benefit to its students, the opportunity for hands on experience practicing on members of the public, who paid the school for the services they received. The plaintiff took this opportunity and provide cosmetology services to the public, under the supervision of the school. The plaintiff worked many hours per week, but was not paid, so he sued the school. In looking at this relationship, the Second Circuit determined that the plaintiff intern was the primary beneficiary of the internship. 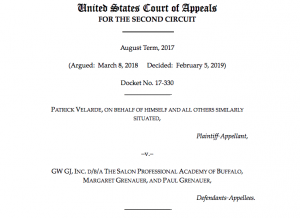 The Court relied on several facts to draw this conclusion, including that the plaintiff gained significant benefits by working for the school such as he able to complete a minimum number of hours of practical work, necessary to sit for a licensing exam. Moreover, the supervision he received prepared him for the licensing exam. The Court was unpersuaded by the plaintiff’s argument that he should be considered an employee because the school profited from his internship. Questions about whether an intern should or should not be paid must be resolved on a case by case basis. The analysis hinges on highly fact specific questions. Those using interns in their workplace should consult with an experienced employment lawyer to determine whether pay is appropriate or not. Interns not receiving pay should similar consult with an experienced wage attorney to discuss whether the minimum wage and/or overtime laws have been violated. The Long Island employment employers at Famighetti & Weinick PLLC are experienced in handling unpaid wage and overtime matters. If you have questions about your internship, pay, minimum wage, or overtime, contact one our Long Island employment attorneys at 631-352-0050 or visit our website at http://linycemploymentlaw.com.